Clean-up of unnecessary files and folders helps to keep your Master File Table nice and lean; with fewer files and folders to index, it’s easier for the system to find what it needs at any given moment. File inventory reporting utilities such as JDiskReport can find duplicate files so one can be deleted, or sort files in order of size to help you figure out where all that disk space is going. I use JDiskReport several times a year, and I always find gobs of files that can be deleted. Backups will also be faster if unnecessary files are eliminated. Most recent comments on "[TUNEUP] Free Hard Drive Tools"
I had a corrupted hard drive. I recovered almost all of it with EaseUS Recovery Wizard. I spent the money for the full version since it worked for me. I like free tools when I can I find them but am willing to pay when I get quality stuff. I had a backup but it was a few days old so this allowed me to get the several files that had changed since the backup. 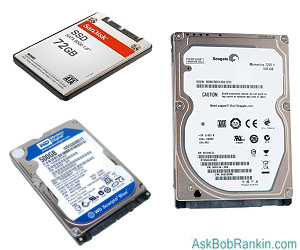 And as Bob has mentioned many many times, make sure you have always have good backups! Not only is it the only way to recover from a serious disk problem but also from ransomware. I'd just like to point out that PrivaZer is a program written and updated by a PRIVATE INDIVIDUAL. He has been nice enough to share it with the world -- along the lines of the old 'Freeware' or 'Shareware' concept. IT WOULD BE NICE TO PAY A TINY SOMETHING TO THE AUTHOR. It need not be much. The free programs I use a lot I like to compensate the company for, just as I'd be willing to make a voluntary donation to Bob for all his works over all the years he's been here. Some companies like Ghostery WON'T accept donations because their stream of revenue comes from other sources, but how's a small guy or tiny company EVER going to make it if you take the program, use it, and then don't pay for it? He DOES ask for a VERY modest donation, and I send him a small donation a couple of times a year. Because, for me, retired and on a very fixed income it's only the right thing to do. So - please do it. Otherwise it's a VERY thin line between free use, and theft. Especially when he says: Pay what you can. So, PLEASE PAY WHAT YOU CAN. If **WE** can make small companies worthwhile for authors, just think of all the wonderful programs that people would be able to produce? What a wonderful would it could be! End of sermon on morality and ethics. The performance improvement after running this tool is impressive. anything similar to Privazer that i could use on my Imac? I've had very good results with Iolo. I recall one of Bob's articles saying their customer service wasn't all that, but have yet to go there (after 6 years). Wonderful article with great hints. Just curious what your thoughts are on Wise Care 365, a program that I am currently using. THANK YOU very much ''BOB'', I meant to Defrag my Hard Drive last week, and YOU just reminded me. Cannot THANK YOU enough. Plus, I will be using the other Tools in your article. If I downloaded all of these utilities would there be any space left for my files. What I'm wondering can they be stored on a USB drive and then use them when needed? I gotta disagree with you about defrag software. I use Auslogics disc defrag and it's orders of magnitude faster than Defraggler. Although I am aware & use of some of these utilities already, you provided some that I did not know. Usually, I'm afraid of using 3rd party software utilities, I feel safer when they are recommended from people and/or websites I can trust, such as you, PC World & PC Mag. I use to subscribe to those mags and also Smart Computing, Computer Shopper, I miss them. Not many others I can still trust. My favorite fixes are/were "Turn-Off & ReBoot" still do that and was "Scan Disk". I upgraded from MSDOS 5.0 to MSDOS-6.1 just to get Scan Disk. Seems like yesterday when we had to "PARK" our heads. Thank God for the 486DX & Xtree-Gold. Retained my sanity. I downloaded Piriform Defraggler and ran the program. However I cannot find the icon for the program (in order to easily launch it in the future). Any suggestions on how to locate the lost icon ? I don't know how I missed this one, but I did. I have used many of the suggested programs by Bob, because I trust him. PrivaZer is one of the best out there. I bought the PrivaZer Pro because I was so impressed. I will admit that PrivaZer is not for everybody, especially Newbies. You must have a good understanding of computers to use Privazer. Bottom line, it is one excellent program! I have used Piriform's Defraggler for some time now. It is slower but I think it really looks in all areas of the HD, to get it properly defragged. Love CCleaner! I have been using CCleaner for years and must have it. I also, purchased CCleaner Pro, so that I could easily monitor the Temporary Files after using my browser. I am also a big fan of Glary Utilities. Used the free version for several years, finally purchased the PRO version a couple of years back. I like to use Glary Utilities PRO first, then use Defraggler to defrag and optimize. Defraggler works very well, by doing this method for me. One program not mentioned is Revo Uninstaller. I simply can not live without this program. I even purchased the Pro version. I know when I uninstall a program that it is done completely. I used the free version for years, as well, before I purchased the Pro version. Every program that I have mentioned, except for the Glary Utilities program, I have used because Bob recommended the programs. Bob does recommend Glary Utilities but I was using it before he "tested" the program. By the way, filepuma.com is a very safe site to download many of these programs and to keep them up to date. This is a Glarysoft website and it really is nice to know which websites are safe for downloading and updating programs. I really like System Mechanic Pro because there are several Built In tools that Help Speed up my PC and it Cleans my Hard Drive of most if not ALL Virus and Malware and other Crap !! Is there anything BETTER than what I am using to Protect and care fore my PC ?? Is there any way to work from home using my PC that is not a SCAM ?? I have tried to find a way to use my PC to earn $$ at Home that is Legal but I can NOT ! I am age 65 and Disabled and I am very POOR and I need to find a Legal way to earn $$ by using my PC ? ?